I love reading. It’s been my favorite pastime since I was young. I remember bringing home massive piles of books from the library each week and actually reading most of them. I have always felt that you can learn anything by reading the right book. Imagine my surprise when I began homeschooling and two-thirds of my offspring struggled to read! My 11-year-old daughter has finally blasted off to the world of reading wonder, but my 9-year-old son still struggles with reading even the simplest stories. A large part of our homeschool day includes learning through Literature-based unit studies. We love to read a book and then dive into learning more about the things in the book. As with any unit study, you can explore any subject, using a story as the starting place. For instance, a unit study based on Little House on the Prairie can teach many different subjects. You might explore such subjects as prairie life, state history, cooking lessons, family relationships, and much more. There is so much to learn from this amazing book! I would hate it if my kids missed out on enjoying it just because they don’t read as quickly as someone else. So how do I teach kids who can’t read very well using stories? While I could (and sometimes do) feel like a failure as a reading teacher, I have found ways to incorporate my love of books into our homeschool day with even the most reluctant of readers. Something I do with my reluctant readers is share the reading. They get frustrated with reading a whole chapter by themselves, so we take turns reading a page (or sentence) at a time. This gives them a chance to practice their reading and a break in between to just enjoy the story. Most nights, just before bedtime, you can find me piled in the bed with a kid on each side, as I read aloud a chapter in our latest history reader. These are books that showcase the lives of people who lived during the time period we are studying. Our latest book is The Singing Tree, but we have laughed over the antics of Simon in the Great Turkey Walk, and cried with Johnny Tremain. If you were to enter our home at any given time, you might be bombarded with one or more stories being blasted through the speakers of MP3 players, phones and stereos. While my kiddos struggle with actually reading the stories, they have a great love of good stories. I like to assign them a related book to go along with whatever we are studying at the time. When I say picture books, you might think I’m talking about using these books for preschoolers. Nope, I use picture books even with my middle-schooler. (And I have to admit, they are some of my own personal favorites too!) 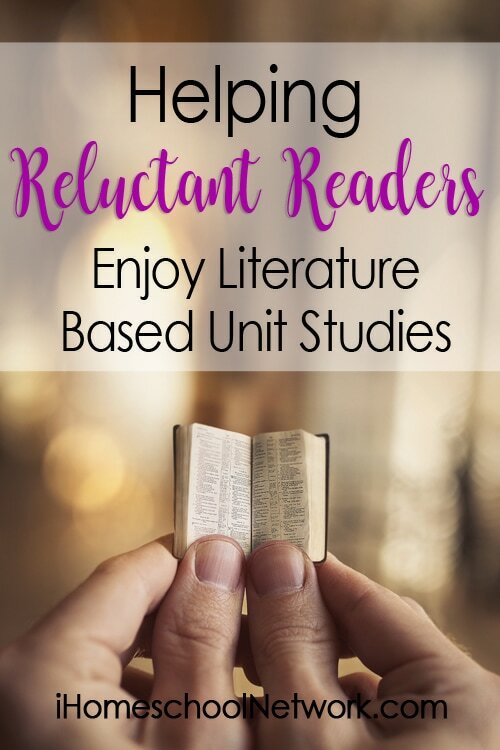 If you aren’t sure where to start with a literature-based unit study for your reluctant reader, start here. Find a really good picture book and read it together. Discuss things that are mentioned in the book that they want to know more about.There you’ve got it… the start of an amazing unit study. For reluctant readers (and writers,) just the idea of a report can cause tantrums. Notebooking is just not their favorite thing to do to. So, with my two reluctant readers, I have to be creative in finding great ways to apply their new-found knowledge. For each unit study, I try to make sure that I include some fun hands-on activities that will help them learn without having to write it all down. We’ve done lots of different activities – from a fun craft activity like weaving, or a field trip to a blacksmith shop. The more hands-on, the better for my reluctant readers. Do you have a reluctant reader? How do you share your love of books with a kid who doesn’t like to read? Amy is a second-generation homeschooling momma, with three kiddos ranging in age from 9 to 15. She is a passionate lover of good books, and is working hard to pass that obsession on to her children. She lives in Wild, Wonderful West Virginia with her kids and one dog, but some days she wants to move to Australia. She blogs at lifeaslanhams.com, where she shares her passion for books, homeschooling, and life!